It was warm in the night and when I woke at 0800 it was to - yes you guessed it - clear blue skies! The sun wasn't quite above the horizon but it felt warm. Up and dressed I made a wet; Cathy had hers in bed while I took a look at where we were heading for next. 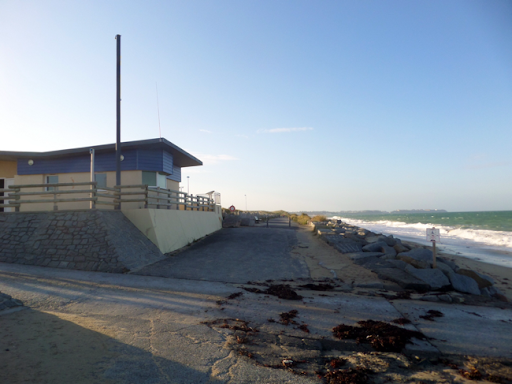 We decided last night not to go to the pink granite coast of North Brittany; we've been there before and we really want to go there again when we can swim in the clear, warm sea. So we decided to head straight for the south Brittany coast. Ideally we'd like to get to Carnac to visit the standing stones, but it would be a 3.5 hour drive and we want to do less of that this time. 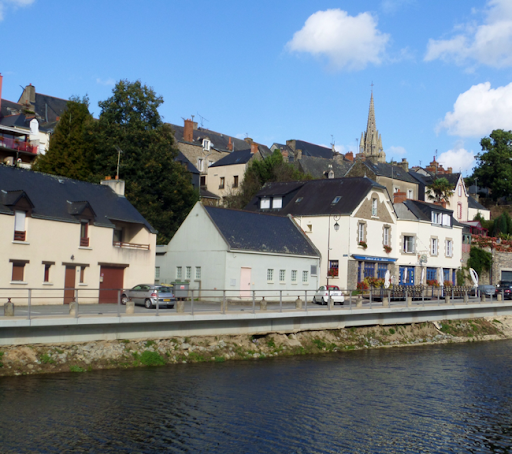 So I looked for somewhere most of the way there and decided on the town of Josselin. It has a large imposing chateau with three 'Rapunzel' towers overlooking the canal and lots of small medieval streets and timbered houses. It also had a free Aire in one of the town squares. Decision made, we went for a walk along the beach, in the opposite direction to yesterday's walk. 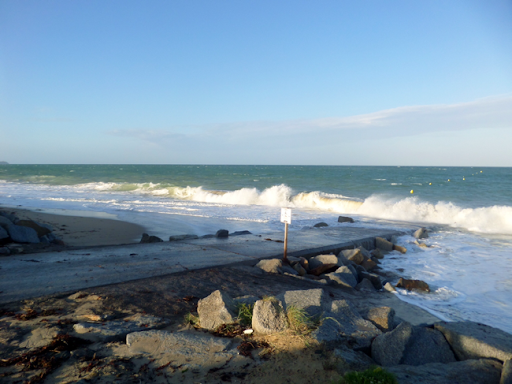 The tide was in and surf was definitely up, but still with enough sand left to walk along the beach. We looked up at the many modern houses overlooking the sea and imagined house sitting in them in the future. Back at the van I sorted breakfast and we sat outside in the warm sunshine. Our over-riding need today was fresh water, but I was able to dump waste on the way out, before we drove off, via St Martin sur Mer. We'd decided to drive down along the coast route - La route de la Baie - with views of Mont St Michel over to the right. 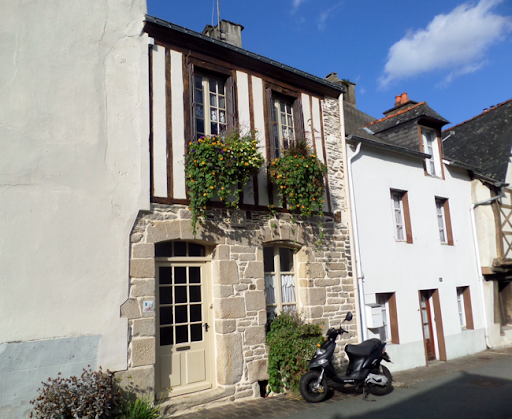 This is an area we know well, having enjoyed a couple of gîte holidays around here. We drove through Jullouville, where we hired a place with Ray & Julie and followed the road south where Ray and I enjoyed cycling so much. One of our favourite cycling spots was around the hills of St Jean le Thomas and it was here that I spotted an Aire de Camping Car sign. We followed this and found a lovely spot, just above the municipal campsite and close to the beach - definitely worth a return visit sometime. We managed (with a bit of a faff and a very expensive €8 - my fault) to fill up with water and we continued our journey south. By now the sky was blue, sun shining and it was a very pleasant 19'C. We stopped at some services for lunch before continuing on to Josselin. The Aire was well signposted and we pulled in to a large square parking area alongside St Martin's church. Once sorted out we walked out to explore. 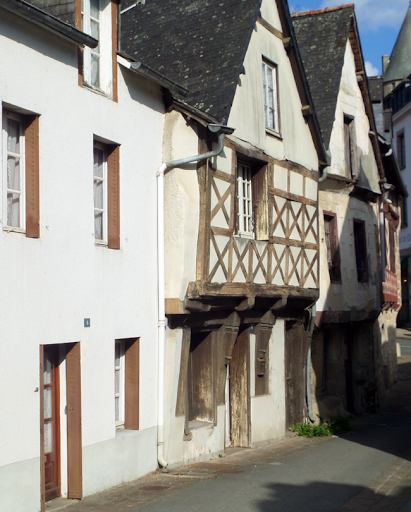 Josselin is a lovely town and we enjoyed walking down the tiny streets with the narrow, tall, timbered cottages. We headed down to the canal and had a walk along and back, before crossing the bridge to check out the other side. Returning, we walked up a steep cobbled road to a square overlooking the gargoyles of the basilica of Notre Dame de Roncier. We checked out a few of the bars and bistros for dinner tonight and stopped at one for une Leffe pression. Thirst quenched, we popped into a shop to buy some local salt, salted cameral sauce and the local digestif. Cathy also bought a new coat and I picked up a bottle of local red 'Celtic' wine for our Apero later. Back at the van Cathy had a snooze while I showered and changed. I tried the iBoost but, although picking up several wifi signals, none were free to log in. So it was Apero time - a glass of red wine and some peanuts, sat in the van in the square listening to the birds as the sun shone through the perimeter trees. It was surprisingly quiet, noting we were in the middle of a town. 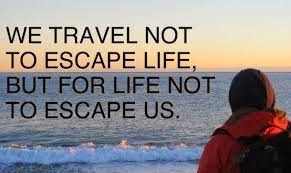 This is one of the things we love with Aires and how campervans are welcomed everywhere. Ready for dinner, we re-traced our steps back to the Bistro where we had an earlier beer. Le Patron welcomed us in to a table inside (it was a little chilly by then). There was American Southern blues music playing and, with his long hair, he was either a biker or a musician - or perhaps both. We never found out but we enjoyed the music and told him so. I ordered a pichet of red wine plus a bottle of mineral water 'avec gas'. We both wanted meat so Cathy had the Bavette with a shallot sauce and I had a Pavé steak; both were cooked to our taste and delicious. Eurosport was on the TV and I managed to ignore it until cycling came on! Mains done the Maître D' asked if we wanted desert. We'd already chosen - Creme Brûlée with apple for C and cheese for me. C's came en flambé, with Calvados burning off to caramelise the sugar - a great idea for the future. I then had a coffee and a warming glass of Calvados. Bill paid and 'á bientôt' and ' bon soir' done, we walked back to the van, as the Notre Dame bells rang for 2100 - a late night for us! Á demain, I look forward to walking in to town to pick up our breakfast and perhaps stop for Un Créme on the way back. Tomorrow we head for Carnac, a centre of ancient and mystic civilisation and many standing stones to hug. Our hippy alter-egos are very close to the surface!